Civilians leave a street in Kandahar City, Afghanistan, on June 14 during a U.S. Army operation. 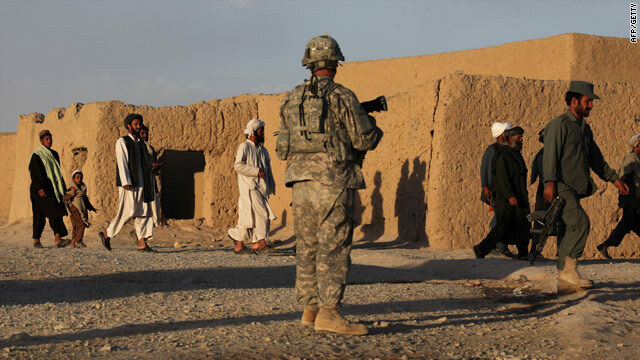 (CNN) -- Security in war-torn Afghanistan has not improved in recent months and violence threatens any strides toward stability, a United Nations report said. "Indiscriminate anti-government element attacks against civilian targets, government representatives and international military forces continued," Secretary General Ban Ki-moon said in his latest report this week to the U.N. Security Council. "The alarming trend of increased improvised explosive device incidents and the occurrence of complex suicide attacks persisted. Military operations also intensified," said Ban, who noted that the country remains unstable despite improvements in the development of Afghan security forces. Ban said he is pleased by a recent assembly of tribal leaders, called a jirga, convened to thrash out the country's peace process. Attempted suicide attacks and rocket fire marred the jirga's opening session, but Ban said the event "proceeded undeterred." Video: U.S. troops out by July 2011? "I am heartened by the outcome of the consultative peace jirga, a step towards reaching out to all Afghans to promote an inclusive dialogue aimed at achieving stability and peace in Afghanistan," Ban said. Ban also said the country's national assembly elections are still on schedule for September 18. He praised the "state of preparedness" of Afghan election officials for the September vote and the presence of more than 400 women on the preliminary list of candidates. "Strengthened Afghan electoral institutions in the lead will instil greater public confidence in the electoral process and contribute to improved, more credible elections," he said. But Ban said election security will be critical and election officials "must balance polling center security against the need to make the elections accessible to all Afghans." He also said that Afghanistan is hosting an international conference July 20 in Kabul where an Afghan-led plan to improve development, governance and security is to be presented. That's a follow-up to a January conference in London, where Afghanistan and its allies met to discuss the country's political and economic development.